scottsee wrote: unresembling any known RFC standard. This was the most enthralling post I've read in awhile! Why/how did they get sent to your site anyway? My primary interest is what the Finnish manufacturer has to do with it. ibarrere wrote: This was the most enthralling post I've read in awhile! Why/how did they get sent to your site anyway? Google has a data center in Council Bluffs, IA, my company has a site just down the road in Shelby, IA. My guess is the carrier unloaded them by mistake. About a month later they were shipped up to me at the corporate offices in Wisconsin. We've been trying to figure out what they were for the last few weeks. By the time it got to me there was no shipping label of any kind. The packaging was just generic foam dividers so we had nothing to go on. I'm pretty happy we were able to return them. So, what does Google give someone who returns a mysterious switch unresembling any known RFC standard under secret development? Better yet, how much would Cisco have given you for it? The engineer was cool and is going to send us some shirts the public cant buy. He's said he would try to hook us with something cool if he can. I'm sure as an engineer he doesn't have a lot of push or purchasing power for things like that. I could tell he appreciated our efforts though. I would like a clearer picture of the transceiver slot, with measurements, but it looks like a CXP. Good karma on you for getting them back to their rightful owner. javentre wrote: I would like a clearer picture of the transceiver slot, with measurements, but it looks like a CXP. Thats by far the closest I've seen but still not quite on. There's a decent picture of the slot on the first page. This cable appears to have two rows of contact points, the pluto switch has a single row. Maybe from a previous generation. looks like it has 2 rows to me. Wow, really nice. Thanks for the pictures. I'm tempted to go write a blog post about this actually. 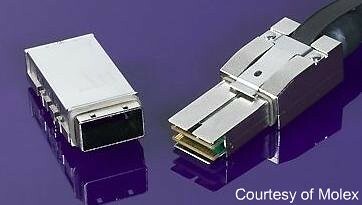 These ports are almost identical in size to an SFP port. The CXP slot appears to quite a bit wider and have a lot more contact points inside. I would agree that its something very similar though. I was researching the chip inside and the manufacturer only referenced gigabit speeds. I think the device would need to be a lot more powerful and have better cooling to handle 10,40,100 gig connections. The switch is about the same size as a Cisco 2950/60 Series. What are the slot measurements? it's also odd that with all the information on the "net" this was not. some serious hush hush going on. - The human mind is the ultimate creation invention. - I have so many customers, my customers have customers. The BCM56820 is a 24-port 10GbE multilayer switch with four GbE ports; each of the 10-GbE ports can also support 1 GbE, 2.5 GbE, or 10 GbE, as well as HiGig™/HiGig2™ protocols. The BCM56820 supports line rate, full-duplex switching for 240+ Gbps and has built-in Layer 2, VLAN, and Layer 3 tables with 10 Quality of Service queues per port. I've scrubbed this topic of the 2 OPs usernames.